Vascular Nursing remains the only clinical reference devoted solely to the nursing care of patients with peripheral vascular disorders. This thoroughly updated and revised text provides a comprehensive overview of vascular disease and presents specific nursing management strategies for each vascular disorder. Valuable for practitioners in both the inpatient and the outpatient setting, the fourth edition includes information on the new minimally invasive endoluminal surgery that is replacing traditional surgery. New technology for diagnostic evaluation of vascular disease and non-operative management of vascular disease is covered in detail. Offers a comprehensive reference on vascular care, with thorough coverage of developments in pathophysiology, evaluation, and management—including the current understanding of hematologic and biochemical factors in vascular disease. Details state-of-the art diagnostic procedures and imaging techniques. Describes the latest interventional approaches, including radiologic and endovascular techniques. Incorporates clinical pathways to facilitate the coordination of effective and economical patient care and documentation. 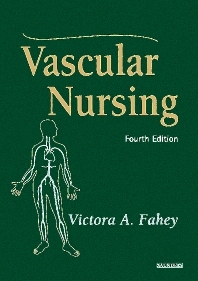 Serves as an effective review tool for the certification exam in vascular nursing. Offers 300 illustrations, including over 150 photographs of conditions, procedures, and outcomes. Features expert contributors from the field of vascular nursing to provide clinical currency and relevancy. Part 1 - Basic Considerations. Arterial Disease. The Venous System. Lymphedema. Part 2 - Peri-Operative Evaluation and Management. Clinical Assessment of the Vascular System. Non-Invasive Vascular Testing. Percutaneous Vascular Intervention and Imaging Techniques. Intraoperative Nursing Care of the Vascular Patient. Medications Used in Vascular Patients. Thrombotic Disorders in Vascular Patients. Part 3 - Arterial Diseases. Vascular Medicine and Peripheral Arterial Disease Rehabilitation. Surgery of the Aorta. Endovascular Repair of Aortic Aneurysms. Arterial Reconstruction of the Lower Extremity. Extracranial Cerebrovascular Disease. Upper-Extremity Problems. Renovascular Hypertension and Renal Artery Occlusive Disease. Mesenteric Ischemia. Part 4 - Venous Diseases. Venous Thrombosis and Pulmonary Embolism. Chronic Venous Disease. Part 5 - Specific Problems.Vascular Access. Amputation in the Vascular Patient. Vascular Trauma.